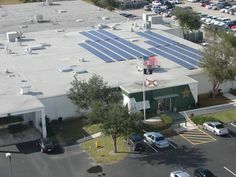 Fafco Solar has completed the FGCU Naples Botanical Garden photovoltaic system installation. 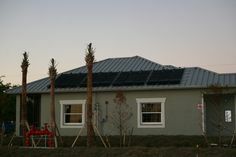 I am particularly proud of this system and the expert installers that did the heavy lifting. The system includes 164 SolarWorld 245 watt solar photovoltaic modules, 164 Enphase M215 microinverters, a Unirac SolarMount mounting system, and S-5! Clamp attachments. 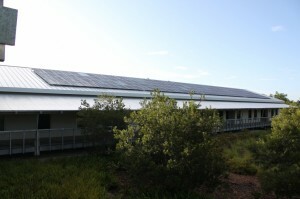 Because of the existing electrical system at the facility, the photovoltaic system is divided into two sub-arrays backfeeding power into two 208V 3-Phase electrical distribution panels. Commercial 3-Phase installations are always interesting from a design standpoint because typically we are dealing with various existing transformers and often generator backup systems. It was truly a pleasure working with the Naples Botanical Garden staff and Manhattan Kraft Construction on this project. The weather cooperated for the most part. The job went very smoothly, finishing about a week ahead of my expectations. 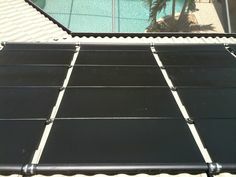 This job is a model for future PV construction projects. 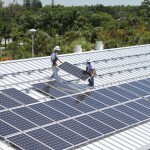 We look forward to the next big PV job as we move on to a large multi-tenant solar water heating job in Fort Myers.